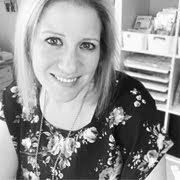 Well here I am again, I will be updating more frequently this month because I signed up for a challenge over at Bon's........Just for July!! 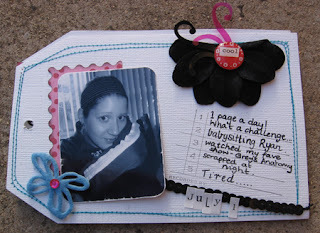 Here are the piccies of my cover and pages for July the 1st and 2nd........using my new Love Elsie Roxie stuff! I am loving it!!!!! I had in mind exactly how I wanted the cover to turn out, using my new Love Elsie stuff, I wanted it bright and funky, I'm so happy with how it turned out! The cover is covered in felt and blanket stitched around outside in bright pink thread. Products used: cardboard, black felt, Love Elsie - roxie pp, Queen+Co blue and red felt, Queen+Co sequin shapes, Love Elsie - roxie round gel, MM letter stickers, Roxie trinket stickers, Roxie alpha stickers, AC thickers, blue felt, Lil davis chipboard shape. Products used: White bazzill, Elsie-Roxie pp, Heidi flower, Elsie-Roxie trinket stickers, heidi photo corners, AL flourish and photo record stamp, black pen, machine stitching. 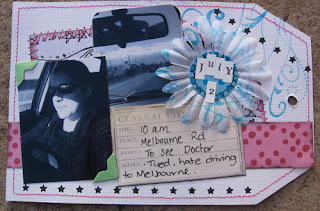 And this page is for the Cyber Crop challenge #2 at Bons as well........challenge was to use a small space (6x6) and journalling strips.....Lots of white space Carmen, Dont Look down!!!!!!!!!!!!!!!! By the way, the stitching is straighter in real life. I am really happy with it.......bit different! Its a piccie of a friends bubba Ryan, when he was at out house. 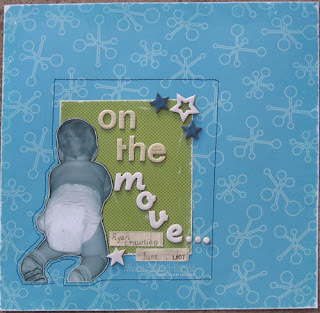 Products used: Scenic Route pp, heidi swapp chip letters, american crafts thickers, american crafts stars, heidi swapp journal spots, white pen, sewing machine, basic grey rub on. Well....news......not much really.............Had a quiet weekend. Clint and I babysitted Brady Saturday overnight and then Sunday we looked after another friends bubba overnight......they are such cuties and luckily (for us) were very well behaved and slept well. Some of you might remember me talking about my car troubles here and how I have spent $2500 on getting this computer problem fixed, well guess what?!?!? Its still happening and not fixed, so back it goes to the mechanic today!! Grrrr.......................soooo angry bout that! Anyways.......best be off, look out! 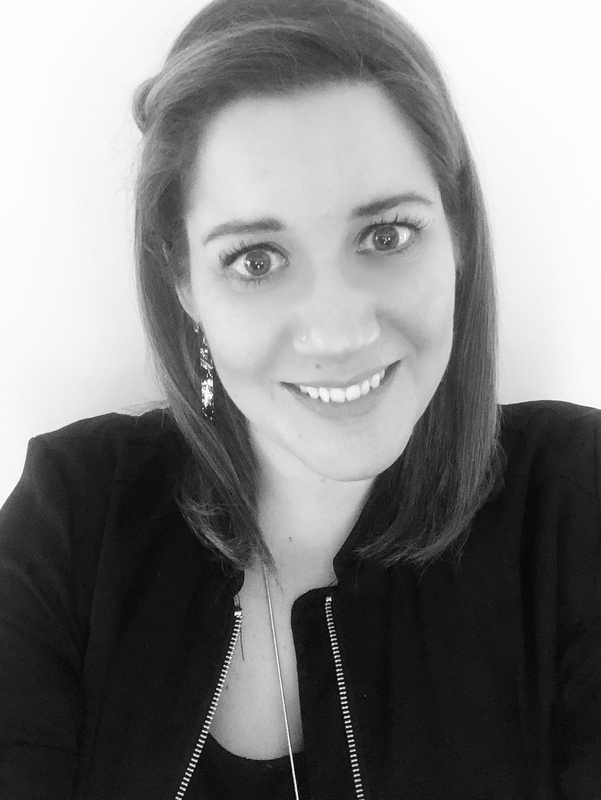 There will be more updates coming soon! haha. 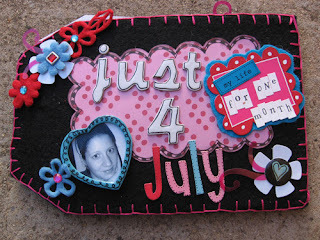 I love the Just 4 July creations and the felt cover is gorgoeus. oh oh that mini album is divine, divine, divine!! It is so funky and cool and I love the blanket stitch, yum!